Pauline (Matthews) Emory, daughter of Milford and Jannie Matthews, was born Saturday, May 3, 1919, in Greensboro, MD. 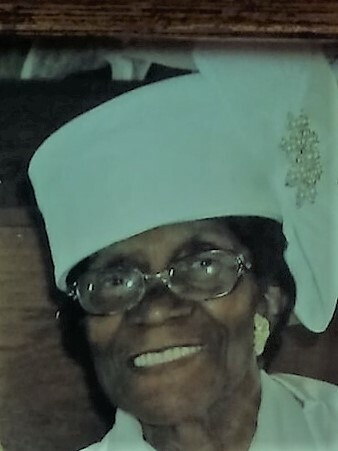 She departed this life peacefully at home on Monday, January 28, 2019, in the presence of her three children and six grandchildren, while hymns played softly in the background. On March 2, 1941 Pauline was united in Holy Matrimony to Robert Henry Emory and from this union, Robert Henry Jr; Charles Bernard and Brenda Paulette were born. morning, even if she wasn’t going anywhere. However, when she left the house, she always wore a hat. That was her signature look. Mom knew she could “rock” a hat! Mom was a rock for her family, especially when her husband passed in 1987, and when her devoted daughter-in-law, Sylvia A. Emory, passed in 2015. Mom’s love, strength and memories remain with her three children, Robert H. Jr; Charles B. Sr. (very devoted daughter-in-law, Deborah) and Brenda P. Berrien (loving son-in-law, James Berrien Sr.); six grandchildren, Donna Young; Robert H. III; Michele Brown; Charles B. Jr.; James W. Berrien Jr. and Tara Berrien. Also surviving are 9 greatgrandchildren; four great-great grandchildren; two devoted nieces, Rev. Dr. Dorothy Wilmore and Jean Brown; her best friend Pauline Young, and many nieces, nephews, relatives, and friends. Celebration of Life Service for Mrs. Emory will be 11:00 am, Friday, February 8, 2019, at St. Paul UAME Church, 3114 N. Market Street, Wilmington, DE 19802, where viewing will be from 9-10:45 am only. Interment immediately following in Gracelawn Memorial Park, 2220 N. Dupont Highway, New Castle, Delaware 19720.